Keep on Rowland: Just the right time.. The day of my last blog post I got a text from two sweet friends saying something along the lines "That blog post came at just the right time... I have really been struggling lately and I really needed to hear that." This got me to thinking of times when this has happened to me.... Times when I have had a heavy heart and was searching for something to lighten that burden... even if I didn't know that's what I was searching for. Just the other day I was really having a rough day. I was driving down the road almost on the brink of tears. (You must know that I am a softy, therefore I can cry over a sad commercial or a friend having a headache. Just because I was crying does not mean I have some major life tragedy.. I'm just a crier. And I'm okay with that ;) Anyways, the guy on the radio started telling this story and it REALLY hit home. I really needed to hear that story and it really helped me to bring my own "problems" into perspective. Sometimes hearing just the right thing at the right time can really change your day, your outlook and your mood. But, more importantly, sometimes SAYING something at just the right time can have the same affect on someone else. You never know when your kind words can have a profound affect on someone else. So, today my goal is to be that encouragement that someone needs....even if I don't know that they need it. 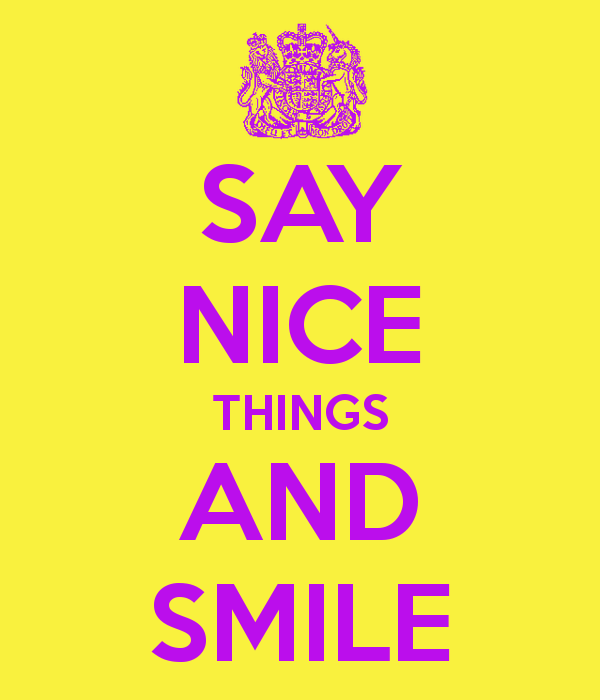 Say nice things. Be excessive with your compliments and kind words to others. You never know when it could really change their day.